Where to Buy Cirkil CX Insecticide, Cirkil CX Concentrate Insecticide Ovicide - 32 oz - $49.95 for Sale with Fast Free Shipping! Cirkil CX Concentrate Insecticide Ovicide - 32 oz kills bed bugs within eight hours of application and works well against pyrethroid-resistant strains of bed bugs. 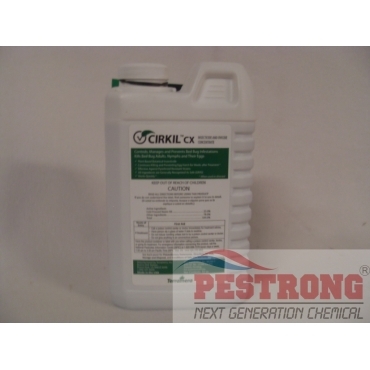 Cirkil RTU Insecticide Ovicide for bed bugs..
Cirkil CX Concentrate Insecticide Ovicid has been formulated using cold-pressed neem oil, a botanical oil derived from the neem tree. Cirkil products pair high standards of efficacy at all stages of the bed bug life cycle with equally high standards of low toxicity and environmental safety. Rate: 32 oz Cirkil CX per 1 gallon of water per 200 - 800 sq.ft. 2.Put a plastic grocery bag sheet on top of the infested item to prevent them from coming in direct contact with treated rag. 5.Tie the plastic bag and leave it sealed for 5 days to control bed bug adults, eggs, and nymphs. Good bed bug insecticide. Work in 1 day. Used the rag in a bag treatment. After 2 weeks customer says no bed bug bites so far. I have tried this by pestrong recommendation. It works. After 1 week later, I can not see bed bugs on my bed. Thanks for good product.